As Agogo Records celebrated its ten years anniversary in 2017, it's about time for an appraisal. Agogo Records' anniversary release is, similar to their back catalog: multi-faceted and iridescent. It's a body of work created by an exceptionally gifted jazz arranger and talented keyboarder, an analog compendium of digitally-crafted Agogo Records classics and a new and oftentimes radical re-interpretation of groovy, electronic club music that has been released via the imprint throughout the past decade. Agogo-mastermind Ralf Zitzmann commissioned arranger and piano player Lutz Krajenski, who has worked with artists like Roger Cicero, Tom Jones, and Manfred Krug in the past, to re-interpret and revisit ten classic tunes from the labels back catalog for this album. Not knowing to which places this journey would lead to Krajenski started to work on tunes originally written by Mo' Horizons, Mop Mop, Da Lata, or The Juju Orchestra and re-arranged them in a way that they obtained a new feel, a new meaning as well as a radically new sound when they were recorded with the help of various guest musicians stemming from Krajenski's inner circle of friends, as well as the singer Alana Alexander. Hailing from New York City, Alana Alexander was raised on a very distinct diet of music from an early age onwards and especially inspired by the sound of gospel choirs as her father used to be one of the most renowned preachers in the Bronx area. She's performed at the famous Apollo Theater in Harlem alongside greats like Eric Benet, Faith Evans, Keiko Lee, and Angie Stone and has worked as a songwriter for the eight-time, Grammy winner, Jay Newland. From Ralf Zitzmann's perspective Krajenski left a very distinct mark on the album's sound and therefore the final outcome is way more than just an anniversary album. For Krajenski it seems like the original tunes sound more like remixes of his own reworks although the albums approach is a contrary one. 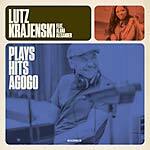 This vital paradigm shift is what turns Lutz Krajenski Plays Hits Agogo into a future classic, an album that seems to become more exciting, detailed and fascinated with every listening session, weighing in an additional gem named "Us" -- an original song written by Krajenski and Alexander perfectly complementing the cover versions and reworks. Also features originals by The Hi-Fly Orchestra, The Soul Session, Una Mas Trio, and Sola Rosa.